In good times and in bad, in sickness and in health, through habeas claims of ineffective assistance of counsel: what defense agreements have joined let no district court put asunder. United States v. Gonzalez, 2012 WL 206266 (9th Cir. Jan. 25, 2012), decision available here. Players: Big win by ND Cal AFPD Dan Blank and Research and Writing Attorney Steven Koeninger. Decision by Judge Hawkins, joined by Judge M. Smith and DJ Duffy. 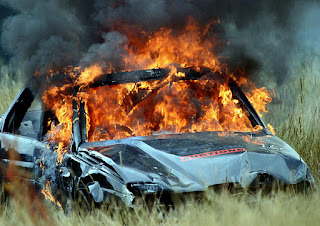 Facts: Gonzalez and his wife were both charged of an insurance scam relating to a car, and with burning the car to further the scheme (a 10-year mand-min). Id. at *1. Their trials were severed. Id. Gonzalez, who went first, was convicted of the fraud and beat the burning-of-the car charge. Id. Gonzalez offered to testify on his wife’s behalf at her trial; her counsel demurred, and the wife was convicted of all counts. Id. The wife filed a habeas alleging ineffective assistance of counsel ("I.A.C.") for failing to offer Gonzalez’s testimony. During the habeas litigation, the government sought subpoenas of the wife’s original defense counsel. Id. Gonzalez’s defense counsel, AFPD Blank, sought quashal of the subpoenas and depositions of the wife’s trial defense counsel. This motion to quash was based on an oral joint defense agreement (“JDA”) between Gonzalez and his wife made before the original trials. Id. at *2. The district court denied the motions to quash, holding that a habeas claim of I.A.C. trumped any JDA, and that all information to and from trial counsel bearing on the I.A.C. claim was discoverable. Id. Gonzalez filed an interlocutory appeal. Id. Issue(s): “On appeal, the government does not advance the rationale proffered by the district court. Rather, it argues that (1) Gonzalez did not sufficiently establish on the record that a JDA actually existed, (2) that such an agreement could not exist in the circumstances here, where Gonzalez’s defense was adverse to [his wife’s], and (3) even if one existed, the court correctly held that [the wife’s] section 2255 claim acted as a unilateral waiver of the privilege in these circumstances.” Id. at *3 (note omitted). Held: 1 & 2: Existence of JDA: “Here, there was sufficient evidence in the record to support the existence of a JDA, at least to a point.” Id. at *4. “If their mutual interest is defined more narrowly [as to the wife’s innocence relating to the use-of-fire count], then it is possible that their other adverse positions did not undermine their joint defense privilege on this specific issue.” Id. at *5. 3. Waiver by Habeas Claim: “[A]llowing unilateral waiver of confidential communications by a single codefendant without the consent of the others would likely severely undermine the rationale for the joint defense privilege in the first place . . . [W]e conclude the district court’s analyses regarding privilege versus work product and unilateral waiver by filing the section 2255 petition were in error.” Id. at *8 (citation omitted). Of Note: Gonzalez joins United States v. Henke, 222 F.3d 633 (9th Cir. 2000) as a lead Ninth JDA decision. (Interestingly, Henke also arose out of the ND Cal). Mine Gonzalez heavily for its many JDA gems: these agreements can be oral, they can be evidenced by attorney conduct, they can be count-specific in the midst of other adverse defenses, and – most importantly – they cannot be unilaterally waived by a co-defendant asserting an I.A.C. claim. That is a terrifically important holding: imagine a JDA that is only as good as long as all defendants remain happy and no one goes after their attorneys on a post-conviction habeas. That JDA would be worthless, making the defense of complex and multi-defendant cases impossible. Judge Hawkins, thankfully, well-understands the broader significance of the Gonzalez decision, and carefully explains why unilateral waiver of JDAs by IAC petitioners would make JDAs meaningless. Id. at *7-*8. How to Use: As Judge Hawkins emphasizes, the defense can have an oral or an implicit JDA (and many times, it makes sense to do so). Nonetheless, sometimes the clarity of a written agreement can moot the government’s whining when the case later implodes. There are many flavors of written JDAs – from limited shared work-product agreements with minimal protections, to full “Henke” agreements with cross-duties of loyalty and confidentiality. Defense counsel interested in these various types of written JDAs can contact the ND Cal FPD for samples. For Further Reading: JDAs are wonderfully complicated beasts that spawn ethical issues by the bushel. For a concise outline of these knotty ethical questions, see here.